Here at Bob’s Market we grow lots of hanging baskets … over 100,000 this year alone! In this blog post we’ll take a look at some basic care tips that can be used for all hanging baskets. We follow these basic tips at Bob’s, and they will guarantee great results. The first thing that you need to consider is lighting when picking out a hanging basket. If your basket is going to be in a sunny area choose plants that can take full sun like petunias. For shady areas, like on a porch, consider impatiens or ferns. Also keep in mind that plants will tend to grow toward the brightest source of light. If you have a basket on a porch remember to rotate it occasionally for even growth. Watering is the most important part of growing a great basket. There are two easy way to check if your basket needs water. Gently pick up your basket to judge its weight, and with some practice, you can quickly tell if your basket requires water. The other method is to simply touch the soil to see how moist it is. When watering your basket a good rule of thumb is to water it until you see water running from the drain hole in the bottom. However, if the basket has dried out too much (you can tell by the weight) water may drain around the soil without being soaked up. 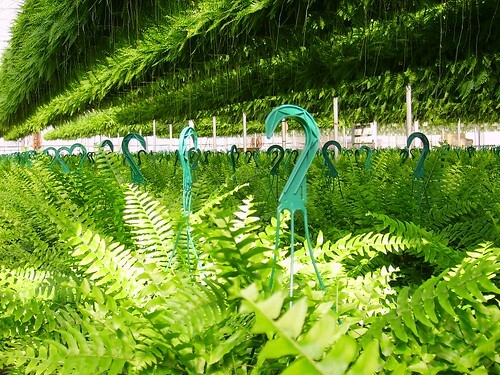 Most plants will look wilted well before this happens, but it can easily happen to ferns. If this occurs, set the entire basket in a tray of water to help remoisten the soil. Fertilizing your baskets is just as important as fertilizing the rest of your garden. Since most baskets will continue to drain for a little while after you stop watering, using plain water will result in nutrients from previous fertilizations being washed from the soil. Here at Bob’s we use a water soluble fertilizer every time we water our baskets, and we recommend doing the same when you get your baskets home. This will ensure that your plants are getting the nutrients they need for the fullest growth and biggest blooms.